After owning this wonderful home since 2003 we have decided to put it on the market. It has been a perfect vacation home for our family. We are retiring and moving farther away and the kids are all grown now. 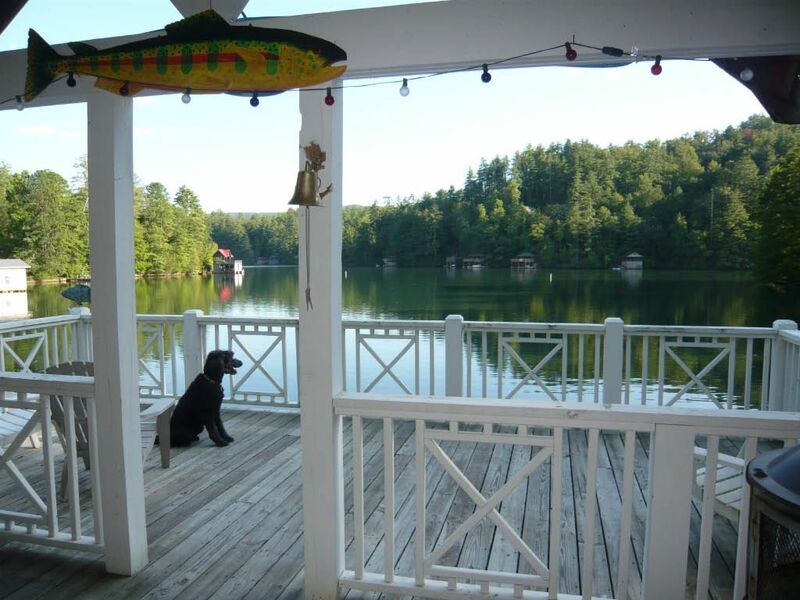 Seal Creek Lake Cottage is a charming Lake Cabin nestled in the majestic Northeast Georgia Mountains on beautiful Seed Lake. Beautiful Seal Creek flows next to our home and provides an incredibly soothing cascading sound. OUR HOLIDAY DATES & RATES ARE FLEXIBLE! Enjoy our Canoe & Two Kayaks on Beautiful Lake Seed. We are Pet Friendly for those who wish to bring their well behaved dogs, we welcome them. Seal Creek Lake Cottage is fully and tastefully furnished to provide everything needed to provide for a wonderful family and friends vacation. The cottage has four cozy bedrooms, a separate den with a queen sleeper, and 2 1/2 half baths, fully equipped kitchen, dining room, two cozy family rooms with wood walls, wood beamed ceiling and two stone fireplaces. And of course, enjoy all the lake activities from the private dock and two story boat house. Swim, fish and relax from the dock or bring your own watercraft and have fun skiing, fishing and exploring the pristine lake and beautiful homes. Enjoying Beautiful Lake Seed: Make sure to enjoy our canoe & kayaks or bring your own boat and tie up to our dock. If you would like, we have a list of marinas in the area that deliver rental boats and jet skis right to Seed Lake. It's a great lake for water sports or as all the locals will tell you, the best fishing in the area. The half-bath is on the main level of our cabin. All linens are provided . Some extra beach towels available but bring your own too. Granite counter-tops; fully equipped but bring your own paper and disposable products. Fun Canoe & 2 kayaks. Bring your own life jackets if you want to use our canoe or kayaks. We do not provide them. Enjoy all the lake activities from the private dock and two story boat house. Swim, fish and relax from the dock or bring your own watercraft and have fun skiing, fishing and exploring the pristine lake and beautiful homes. Enjoy our Canoe & Two Kayaks on beautiful Lake Seed. Seal Creek Lake Cottage is fully and tastefully furnished to provide everything needed to provide for a wonderful family and friends vacation. The cottage has four cozy bedrooms and two and one half baths, fully equipped kitchen, dining room, Two cozy family rooms with wood walls, wood beamed ceiling and two stone fireplaces. Although we booked this place last minute to get away from a hurricane, we had a fantastic time. The cabin is great with plenty of room for everyone. The kids loved the creek and fishing from the boathouse. There are two towns that are a 20 minute drive. Chris was amazing and gave us a ton of suggestions on restaurants and activities. We are looking into booking again. I highly recommend this place! A very nice and restful lake getaway! The waterfall in the side yard makes this property unique. This was a great experience and peaceful for my family & I - We are VERY happy we found this cabin. Is away from the congested city, It is quiet next to a small creek of water that you hear the sounds all day & nature all around. The house is well equipped with games for the family game nights next to the fireplace & a full kitchen to even host a party! I would definitely recommend this to anyone that want to scape. We stayed at this lovely property in the fall with another family. It was perfect! The house is cute, the property is wonderful, and the boathouse is AMAZING! The house and dock are kept up very nicely. We'd love to return for another get-away! We are so glad you all had a good time and look forward to having you back anytime! Perfect place to stay and relax - or play! This is one of the most inviting lake cabins I've ever seen! There's a charm to this Lake Seed destination that might remind you of an olde time-y cabin, but it's modern layout and huge interior will remind you that you're in this century! Downstairs, you'll love the cavernous living area with a big fireplace, large tv and ample seating arrangements, a large dining area, and a cozy den where our kids played for hours on a foosball table and with an endless array of games. Upstairs hosts 4 good-sized bedrooms, each with it's own unique features, a great size, and sparkling clean. My favorite part of this cabin, though, is that there are hundreds of places to sit and enjoy. You can sit in the corner of the den and watch the kids put together puzzles or duke it out at foosball; you can sit to the side of the dining area and watch the action of the kitchen or the adults at the oversized dining room table playing cards; you can sit in a corner of the living room and just take in the stillness of the cabin; you can sit upstairs on the sleeping porch and enjoy the outdoors without bugs; you can sit on the porch right outside the master bedroom and take in a breathtaking sunrise; you can sit on the deck of the dock, which is tastefully decorated and has an ample choice of seating. There is indeed a road to cross to get to the dock, but I really appreciated being tucked into a corner of the road that felt a bit secluded. This also made me feel more secure with the kids being outside as they had SO much to explore in a gorgeous creek running right alongside the house. I don't think there could be a more gorgeous place in the world to do dishes than standing in this kitchen looking out over the mini-waterfalls of the creek - amazing! I did not have cell service and I did not miss it one bit! This is the perfect place to get away from reality and to unplug for a few days! If you're dying to stay connected, though, the wifi is perfect. You might find that you thoroughly enjoy paddling around the lake in the canoe or kayaks (we brought our own lifejackets). Carol is a joy to deal with and is prompt and courteous in all her interactions. This property is also just a short drive from Tullulah Gorge and tons of hiking. My only regret is not having more time here. Will definitely be looking to stay here again! I recommend it for all ages, as we enjoyed it and we ranged in age from 2 months to 70! David and I are so happy that you enjoyed our place and certainly hope next time you can stay much longer for your family vacation! Lake Seed is located in the middle of the chain of Lakes known as Burton, Seed and Rabun. Known for its beautiful mountain lakes, cool water streams, pleasant summer evenings and a vibrant display of fall colors, Lake Seed is one of the southeast's premier mountain lake destinations. WE ARE FLEXIBLE FOR HOLIDAY RENTALS DATES - ADDITIONAL FEES MAY APPLY. $400 Security/Damage Refundable Deposit payable with final payment $200 Cleaning Fee $125 non-refundable pet fee Monthly Rentals Available - please call for rates. Check-in time: 4PM & Check-out: 10AM. Rates listed do not include 12% state&co. taxes unless noted. NOTE: Until confirmed, rates are subject to change without notice.